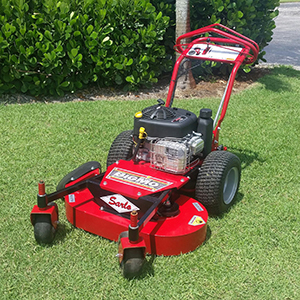 Sarlo Power Mowers introduced the new BigMo 34 Hydro, a walk-behind mower with a 34-inch version of the company’s Twin Track Deck. The BigMo 34 Hydro is powered by a 10.5-hp engine and hydrostatic drive system. It features an in-line spindle design built into the platform. The BigMo 34 Hydro offers seven cutting positions with no-tools height adjustment; bearing-mounted, no-flat front swivel caster wheels; large rear turf tires; positive reverse and differential axle; electric clutch; commercial, greaseable blade spindles and a fabricated deck.